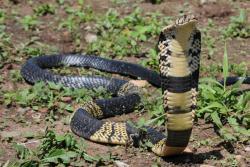 Before the new species were discovered, forest cobras were not considered threatened. But some of these newly recognised species are found in much smaller areas and may be far less common, and much more at risk from forest loss or even bush meat hunting. “The findings raise more questions about their status and the steps which need to be taken to safeguard their conservation,” added Dr Wolfgang Wüster. 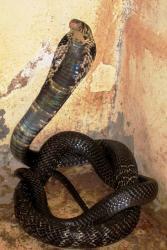 Historically, naturalists relied on the visible differences between specimens to identify different species, but all forest cobras are fairly similar in appearance. Although variations in pattern and the numbers of some scales had been noted, due to their similarities to even the trained eye, correct identification of the five new species would have been nigh on impossible before the advent of DNA techniques. Two Bangor University Masters students, Richard Storey and Cara Hall, worked on the molecular side of the project as part of their Masters degrees and are included as authors of the research paper. The list of authors also includes another ‘Bangor-bred’ herpetologist, Axel Barlow, now at the University of Postdam, Germany.